Featuring 3 swimming pools, a Mediterranean restaurant, free Wi-Fi and sports facilities, Camping Esponellà is located in Esponellà, beside the river and surrounded by tranquil woodland. Offering a covered porch with furniture, each 2-bedroom bungalow is equipped with air conditioning and heating. There is a simple kitchen including a cooker with hob, fridge and microwave, and the private bathroom has a bath or shower. Bed linen is included. Camping Esponellà offers facilities for a variety of sports including minigolf, tennis, football and volleyball, as well as a children's play park. Guests will find a bar-supermarket on site, and the restaurant can also do food to takeaway. In summer the camp site opens its club and children's activities. The surroundings offer excellent opportunities for outdoor activities such as kayaking, cycling, hiking and more. 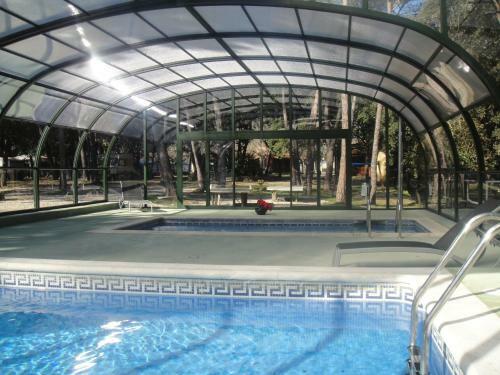 Camping Esponellà is 8 km away from Bañolas Lake, and 20 km from Museo Dalí Musuem in Figueras. The medieval town of Besalú is 30 km away, and you can drive to Girona Airport in 30 minutes.